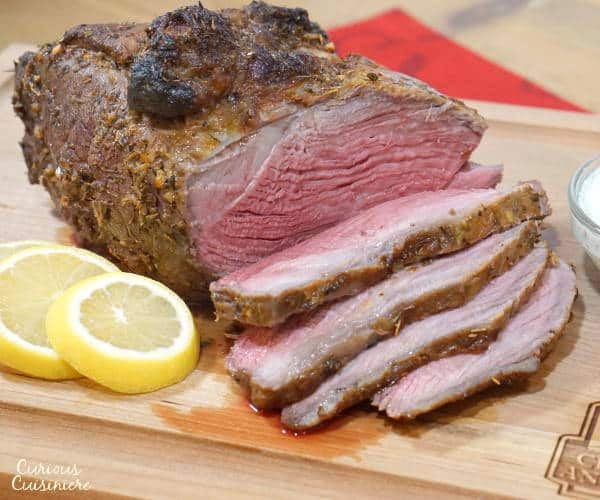 Bright and savory, Greek inspired flavors give this marinated sirloin tip roast a robust flavor that is perfect for a holiday roast or any special occasion. But, when it comes to beef, not all fat is created equal. You see, fat = flavor. and those small white flecks of fat you see inside the lean of the meat are called “marbling”. When choosing a cut of beef, don’t be put off by these bits of fat. Marbling is what contributes to the tenderness, juiciness, and flavor of the meat. This marbling fat is a healthy, monounsaturated fat – the same type of fat that you find in olive oil. When choosing a roast, you want to look for small flecks of marbling fat that are evenly scattered throughout the cut. 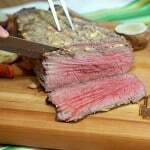 Avoid roasts that look like they have “veins” or channels of fat through them. These channels typically separate different sections of muscle, which can make properly slicing your roast (against the grain) a bit tricky. 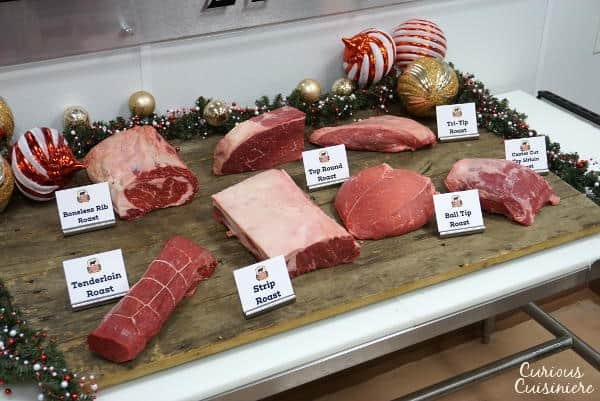 Take a look at the many types of Certified Angus Beef® Brand roasts below. You can really see all the nice marbling in the Top Round and Rib Roasts below. Now that you know what to look for in your roast. How will you choose which roast to cook? With so many different types of roasts, choosing a roast from the butcher’s meat counter can be a bit intimidating. That’s where the Roast Perfect App from Certified Angus Beef® Brand comes in handy. 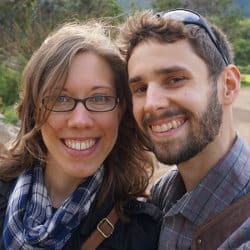 We’ve talked this App before, and we’ll talk about it again. Heck, we’ll talk about it to anyone who will listen! 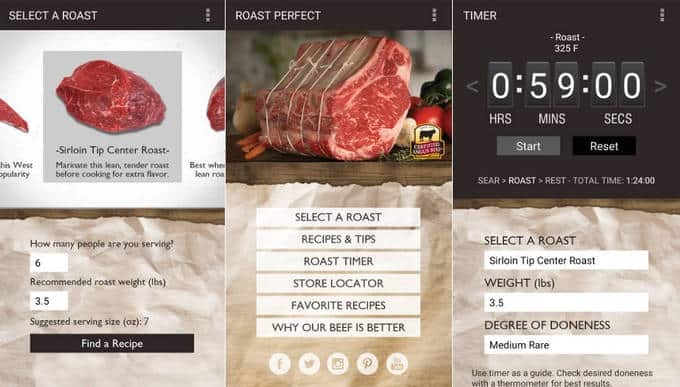 Not only does it give you recommended roast cuts for you cooking method with a short description of each roast and recipes, but it also gives you a a roasting timer specifically tested for your cut, weight, and desired done-ness. The chefs at Certified Angus Beef® Brand roasted many roasts, carefully measuring the temperatures to get their timer to be perfect. 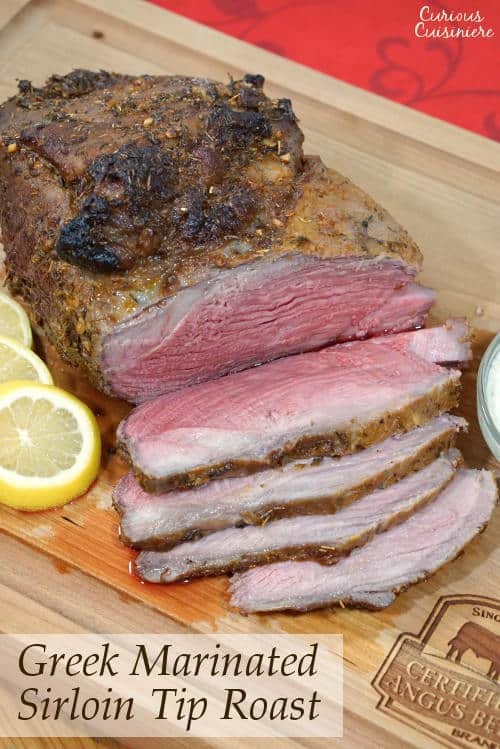 And, thanks to the Certified Angus Beef® Brand chefs, our roasts have always been spot on when we’ve used the App! 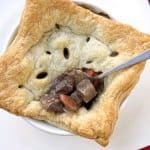 The roast timer in the Roast Perfect App also includes a nifty trick to seal in the juices of your roast and start creating a perfect, crisp, and flavorful crust. A common technique when roasting is to pan-sear your meat before placing it in the oven. But, the Roast Perfect App has you preheat your oven to a temperature that is higher than you will be roasting at. For the first 15 minutes, the roast sears in the oven at this higher temperature. Then, you lower the temperature, and the main roasting happens. Do you know what really excites us about this trick? No extra pans to clean! We love how easy this technique has made roasting. It’s simply a matter of seasoning the meat and then popping it into the oven. 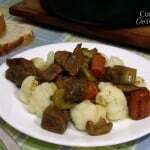 After that, we can turn our attention to the other elements of the meal, like sides and sauces! 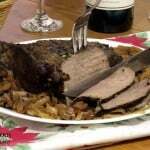 For more great tips on creating the perfect roast, check out our Keys To The Perfect Roast Beef article. 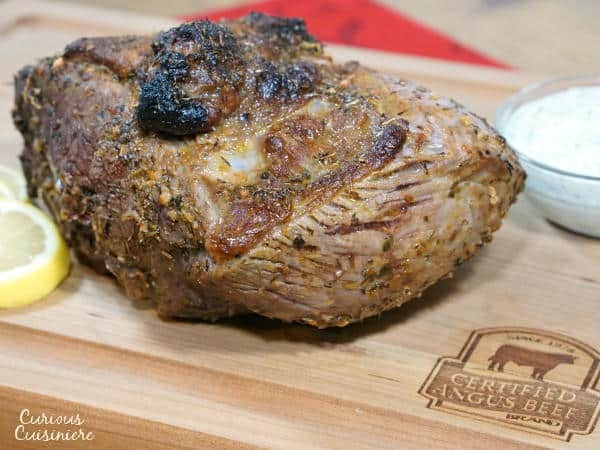 The Certified Angus Beef® brand Roast Perfect App provides all the information you need to roast with confidence! For today’s roast we chose a Sirloin Tip Roast. This value cut is tender, lean, and economical. Quite the win! We marinated our roast overnight in a Greek-inspired mixture of lemon juice, olive oil, and herbs. The marinade gives the meat a slightly citrus-y flavor that is bursting with savory oregano and garlic. Tim called it a cross between having a Greek gyro and a Holiday prime rib. To add to the Greek flair, we served the roast with a classic Greek Tzatziki, a creamy yogurt and cucumber sauce. But, of course, we added a twist. We love our beef with horseradish, so we decided to throw a little grated, fresh horseradish into the tzatziki to kick it up a notch. With the fun Greek flavors and the slight horseradish kick from the sauce, this roast is definitely a show stopper that is perfect for the Holiday table! For more tips to get you roasting this holiday season, and another great beef roast recipe, check out our Mustard Crusted Top Round Roast where we talk about how to figure out how much meat you need for your guests and what the ideal temperatures are for each level of done-ness. So, where can you find this wonderful app? It is FREE from the iTunes store (for iPhone and iPad) and from Google Play (for Android). Just download it like you would any other app and get roasting! To find Certified Angus Beef® brand beef near you, you can use the Store Locator section of the Roast Perfect App or search their site for where to buy. In a small bowl, mix together the lemon juice, olive oil, minced garlic, oregano, salt, thyme, paprika, and ground black pepper. Place the roast on a large piece of plastic wrap and coat it with all of the marinade. Wrap the roast tightly with the plastic wrap to seal in the marinade and refrigerate for 6-8 hours. 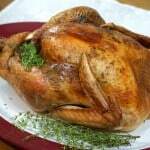 Remove the roast from the refrigerator 1 hour before you are ready to roast, to let it come to room temperature. Place the roast on a rack in a roasting pan (or on a rack in a baking sheet with sides) and place in the oven for 15 minutes. Remove the roast from the oven, tent it loosely with foil, and let it rest for 10 minutes. After resting, the internal temperature should read around 135F. While the roast is cooking, make your Horseradish Tzatziki Sauce by mixing the Tzatziki Sauce with fresh grated horseradish root and sugar. This sauce improves with time, so it can even be made immediately after you marinate your roast. 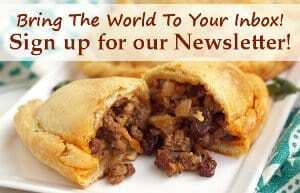 Keep it in a sealed container in the refrigerator for up to 1 week. *If you’re not a horseradish fan, you can dial it down in the sauce. Using 1 Tbsp doesn’t pack much punch at all; rather it just adds a really unique flavor. 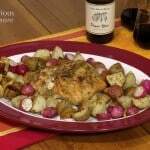 Great choice to make this with Greek flavors! I love it! Wow…wow…WOW all I can say is YES PLEASE!! I have not yet marinated a roast, but you are convincing me! You made a PERFECT roast! Thanks Dorothy! You should definitely try it! The marinade sounds like something we’d like! Thanks Sue! Give it a try and let us know what you think! I love Greek flavors, but I usually put them on chicken. I never thought to put Greek seasoning on beef. Perfectly delicious! We love them on chicken and lamb, so we though… why not? 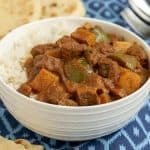 They do work so well with beef! Love Greek flavors! The leftovers would be great in some pita, especially with your horseradish tzatziki! That Tzatziki horseradish sounds wonderful! We loved the way the flavors of fresh cucumber and tangy horseradish combined! Loving the seasonings you used here! Beautiful roast! I love this Greek inspired roast recipe, Sarah! Great shots!! What a terrific marinade! I’d love to try it on flank steak!!! Your roast looks perfect. Ooh. 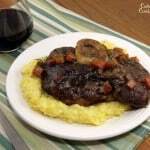 It would be wonderful with flank steak! Oh my. Just oh my goodness and it on a beef roast. YUM! YES! We went out on a limb with the combo, but it is SO good!